On the surface, Nigeria’s oil sector has dropped in significance to a mere 13% of real GDP, while the services sector has climbed to 40% in real terms. Yet, the reality is that it is the country’s oil revenues that have supported growth and, to a large extent, maintained social order. Without oil, both would fall apart; government spending would be much smaller, interest rates much higher, and the currency’s valuation much lower. ….. the country’s domestic savings rate, at a measly 20 per cent of GDP, is extremely low for a developing economy at this stage. 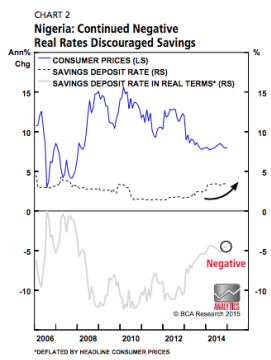 A key reason being the government’s inability to tame chronically high inflation, meaning bank deposits have earned negative real interest rates for most of the past decade. More on this here (HT Tyler Cowen). And by the way, on this score Nigeria is not alone. In an instance of the triumph of hope over experience The Economist recently pronounced the end of the resource curse in Africa. I do not completely buy their argument. Yes, growth and investment across the Continent may no longer be tightly coupled with natural resource cycles. But from Ghana, to Zambia, macro-economic stability (and important aspects of social spending) are still very tightly tied to movements in the global commodity markets. Furthermore, many of these countries have recently re-entered the global debt markets partly backed by primary commodities as surety. The same applies to debts owed to Beijing. Last year alone foreign debt issues in the region exceeded $6.5b. As I argued in June of 2013, we might be entering another pre-1980s debt bubble. The exchange-rate risk of sovereign bonds sold by sub-Saharan African governments between 2013 and 2014 threatens losses of $10.8 billion, equivalent to 1.1 percent of the region’s gross domestic product, the ODI said. While Eurobonds are typically issued and repaid in dollars, the depreciation of local currencies in 2014 makes it harder for governments to repay them. All this brings to the fore SSA’s biggest challenge over the next two decades: How to carry out massive investments in infrastructure and human capital, while at the same time maintaining a sustainably balanced macro environment that is conducive to long-term saving.